Seriously. As a family, we have spent about 80% of this year in the hospital, in doctor's offices, (or waiting rooms- ugh) the Urgent Care, and random surgery centers. This weekend was no different. Little Man was fighting a losing battle with dehydration. He refused to eat for the better part of two whole days and did a lot of puking. (and sleeping in his own puke) This led us to spend the entire morning of Saturday in the ER, getting Little Man back in the black. He's doing better today- at least he's taking some formula! Now... can I brag? Just a little? About my Little Man? As some of you may know, or at least imagine, getting an IV line... it does not make for the best day in your life. But for a baby? It's gotta hurt like crazy. My little boy just sat there and took it... like a MAN. There was no crying! Not a peep! When the nurse was taking it out (the hurty part in my experience) he was smiling and cooing at her. He was flirting with that nurse quite a lot, in fact. 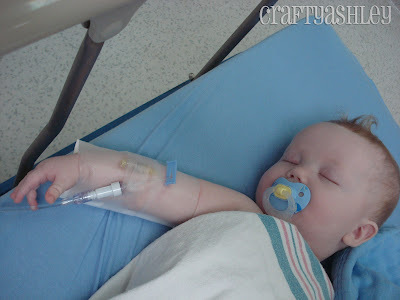 Oh no about little man having to get an IV!!!! I'm glad he's doing better! If you ever need to drop the girls off or whatever PLEASE do so!!! anything to make your life a bit easier!!! and as for little man being a flirt?! well when he's THAT cute how could he not be? seriously I want to kiss his cheeks off! precious! what a good baby!!!! Oh poor little guy...how brave!!! I hope that he feels better soon!! !